Any headline you've read about Cindy Wu probably contains these stats: three minutes, $1.2 million. The student-turned-innovator made people sit up and take lots of notice after her short pitch at Y Combinator's 2013 "Demo Day" brought in--yes--$1.2 million for her start-up. Experiment, a crowdfunding platform for research that was developed by Wu and her colleague Denny Luan, is one of those brilliant yet simple, leap-forward ideas for the future of science. So maybe it's not too surprising that the project has garnered so much interest. But we think Wu's short pitch had a wealth of ideas that can enrich all kinds of speakers as well. Got three minutes to spare? Watch the video, and read more about what we thought made this speech a gold mine from the start. Talking faster won't help your audience learn more. Ack! Three minutes! I need to speak faster so that I can cram it all in! Happily, that's not the path Wu chose. Her three minute pitch actually clocked in at two minutes and 53 seconds, and there's not a point in it where she sounds rushed or vague. She speaks slowly, she takes significant pauses, and she breathes. Applicants to Y Combinator go through an extensive boot camp that helps the start-ups refine their pitches, and that practice really shows here. Wu is able to speak slowly because she has whittled down her presentation to the specifics that an investor needs to know: this is what the project does, this is how it has succeeded to this point, and this is how you can help. No doubt Wu also practiced her measured delivery as well. Speaking too fast is a common speaker problem, especially among those who give TED-style talks and feel the pressure of strict time limits. Luckily, there are lots of ways to curb your speedy speaking. Sometimes the best place to start a story is in the middle. I expected Wu's pitch to begin with how she and her partners came up with such a great idea in the first place (it is a cool story, after all). But the "origin story" is instead buried in the middle of the talk, and I think that was a smart decision. Her audience needed to know right away the value of what they might invest in, so she started with the what and how of the project. We're used to hearing stories in chronological order, but it's fine to mix that up if it seems like a different approach would better suit the occasion or the audience. Big ideas don't need big words. With continued thanks to Eloquent Woman colleague and speaker coach Peter Botting, this speech is a perfect example of that wise phrase. Wu's a scientist, and her project funds some intensely complex research, but she keeps her descriptions short and her words simple. 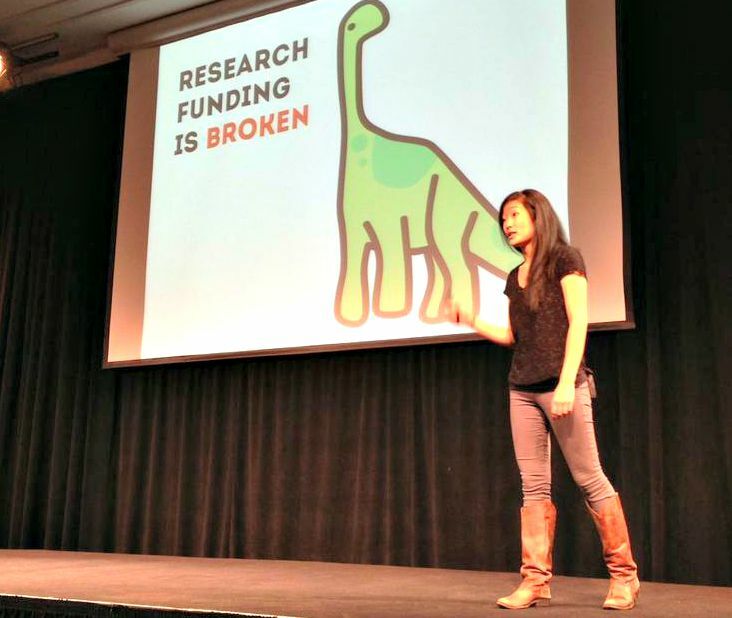 It also didn't hurt that the three types of research she chose to highlight--cancer, gun violence, and dinosaurs--are accessible topics with wide public interest. And then, there's this killer closing line: "What we've created turns everyone with a credit card into a modern-day patron of science." You can watch the video of Wu's pitch below. I've got two small-group workshops coming up on Creating a TED-quality talk in Washington, DC, in January. Choose the January 14 workshop or the January 28 workshop. All you need to do is bring your one big idea for a talk in the style of TED. You'll learn how to plan, write, time, practice, and deliver it in a group limited to 5 people per workshop. Join us!